Furniture and gifts should simplify activities and solve small and large problems. There is seldom one single need that is calling for a piece of furniture, and this situation was a good example of that. A father’s gradeschool aged daughter needed a desk for her bedroom. There was already a fairly new matched bed and dresser. Unfortunately, the furniture manufacturer did not offer a desk. 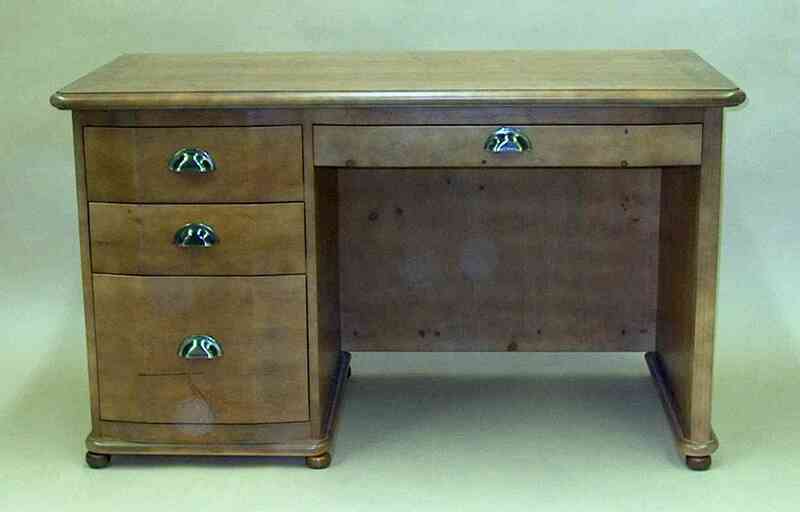 The primary needs were to match the style and coloring of the existing bed and dresser, to have room on the desk top for a lamp, computer and notebook, and to have one drawer with hanging file capability. Secondarily, the desk had to offer long term value, by seeing the daughter through high school. The style was copied from the dresser, and construction was fairly straightforward. “Matching” existing furniture is a lofty and sometimes expensive goal – tooling and patterns often are unique to particular furniture lines. However, sufficient similarity often can be achieved at a reasonable cost, even if the two pieces are only a few feet apart. In this example, the rounded edge of the desktop was made nearly identical to the dresser top, and the drawer base matched the base of the dresser. The privacy panel and right end were made “in the style” of the dresser. With some sample panels, a finishing schedule was developed that was very similar to that of the bed and dresser. With the daughter in college, the desk is now in use by the father in his home office, increasing the long-term value.